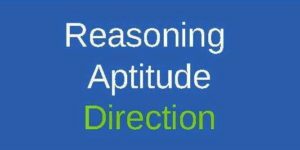 Reasoning Related Most Question With Answer Set 26 Current Affairs, Aptitude And Join the best Online Test Series & get all India Rank, Logical Reasoning. Logical Problems · Number Series · Verbal Reasoning and important Question & Answer with solution & Formulas in Hindi & English And Important Questions with Answers to Numerical Ability asked in Gramin Bank Office Assistant Exam And These all questions will very helpful to you for the forthcoming Bank exams, SSC CPO SI Delhi Police and Rajasthan Police and All Competitive Examination. A group of eight individuals – A, B, C, D, E, F, G, and H – are sitting in a straight line facing the north. Each of them has a different car – Toyota, Renault, Tata, Mahindra, Maruti, Ford, Audi, and Honda but not necessarily in this sequence. The color of each car is different ie pink, yellow, red, blue, orange, white and green, but it is not necessary that in this order. A has a Maruti car and is sitting at the third place from the left side of F. Neither neither nor F is sitting at the end of the line. E has a pink color that is a Tata car. E is not the closest neighbor of either A or F. H is sitting in the second place from the right of C and it has an orange color car. C has an Audi car with a red color. G has a white color Toyota car And he is sitting at the end of the line. B has a green colored Mahindra car and it is sitting at the far left of A. A does not have a blue and yellow color car. The person with the Honda car is sitting at the far left of the person who has a Toyota car. F has a renewable car. F does not have a yellow car. आठ व्यक्तियों– A, B, C, D, E, F, G और H – का एक समूह एक सीधी रेखा में उत्तर कि ओर मुख करके बैठा है. उनमें से प्रत्येक के पास विभिन्न कार है– टोयोटा, रेनॉल्ट, टाटा, महिंद्रा, मारुति, फोर्ड, ऑडी और होंडा लेकिन आवश्यक नहीं कि इसी क्रम में हों. प्रत्येक कार का रंग अलग है अर्थात गुलाबी, पीला, लाल, नीला, नारंगी, सफेद और हरा, लेकिन आवश्यक नहीं कि इसी क्रम में हों. A के मारुती कार है और वह F के बाएं से तीसरे स्थान पर बैठा है. न तो A न ही F पंक्ति के अंतिम छोर पर बैठा है. E के पास गुलाबी रंग कि टाटा कार है. E या तो A और F का निकटतम पडोसी नहीं है. H, C के दायें से दुसरे स्थान पर बैठा है और उसके पास नारंगी रंग कि कार है. C के पास लाल रंग कि ऑडी कार है. G के पास सफ़ेद रंग कि टोयोटा कार है और वह पंक्ति के अंतिम छोर पर बैठा है. B के पास हरे रंग कि महिंद्रा कार है और वह A के ठीक बाएं बैठा है. A के पास नीले और पीले रंग कि कार नहीं है. वह व्यक्ति जिसके पास होंडा कार है वह उस व्यक्ति के ठीक बाएं बैठा है जिसके पास टोयोटा कार है. F के पास रीनॉल्ट कार है. F के पास पीली कार नहीं है. Question. (1) How many people are sitting between B and F? B और F के मध्य कितने व्यक्ति बैठे हैं? Question. (2) Which of the following car has H? H के पास निम्नलिखित में से कौन सी कार है? Question. (3) Who is the third from the left of G? G के बाएं से तीसरा कौन है? Question. (4) Which of the following is a Ford car? निम्नलिखित में से किसके पास फोर्ड कार है? Question. (5) If E is related to D and B is related to C, then what is the related to C key? यदि E, D से संबंधित है और B, C से संबंधित है, तो उसी प्रकार C किस से संबंधित है?